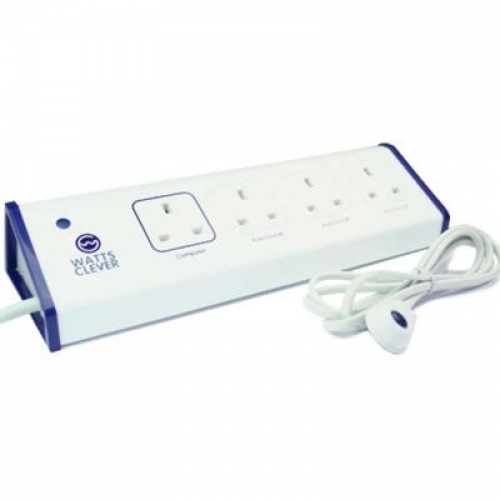 The Auto Off Energy Saving Surge Protector from Watts Clever is indeed a clever little device that will save you money on your electricity bill whilst protecting your devices from power surges. In fact, it is so clever that it won the prestigious PC Pro Recommended award! It is so easy to use. Simply plug your PC into the control socket (the one with the blue square around it) followed by any peripherals such as speakers, storage drives, printers, scanners, table lamp, etc into the remining three sockets. You can even plug in a 4-way / 8-way adapter! When you shut down your computer, the power to everything that is plugged into the Watts Clever device is automatically disconnected. So even if they are shutdown mode or on standby, you will not be using the energy that is drawn from these devices. To turn them back on, simply press the button and everything is back on with full power. Not only does this device save you energy and money, it also has built in protection against power surges and brownouts. We love this product so much that we now only offer the Watts Clever device to all of our business clients as standard! "Each year we have more and more computers, TV's, Hi Fi equipment, and other equipment around the home and office. All this is great, but it pushes our energy costs up and up. The more of these types of products we have the more we leave equipment in standby mode. The electricity used whilst in standby mode can add up to significant amounts across weeks, months, and years. Often we just leave our items switched on or in standby mode, this is costing us a lot of money and needlessly using energy. In addition to this, leaving our equipment turned on shortens the life of the product, and also increases the fire risks etc. The Watts Clever range of Standby Control products helps people and companies to ensure that they turn all relevant equipment fully off. Our products ensure that this becomes a simple operation and something that will be done automatically, or with the minimum of thought. The PC standby control unit will automatically cut off the electricity to your computer and all your connected peripheral equipment. This would be your scanner, printer, speakers, table lamp etc. Also it is possible to add further equipment by adding an extension socket to one of the sockets on the unit. The main control PC/laptop is plugged into the control socket, your peripheral equipment is connected to the auto ON/OFF sockets. Place the control switch in a convenient position next to your PC. There is an adhesive patch on the bottom of the control switch to secure it if required. When the PC is turned off the unit senses the drop in power levels and will automatically cut the power to the PC and the auto sockets for the peripheral equipment. To restore power press the control switch, power will then be restored to the PC and your peripheral equipment. You can then operate your PC in the normal way. It is as simple as that to save money, save energy, and to protect your equipment."